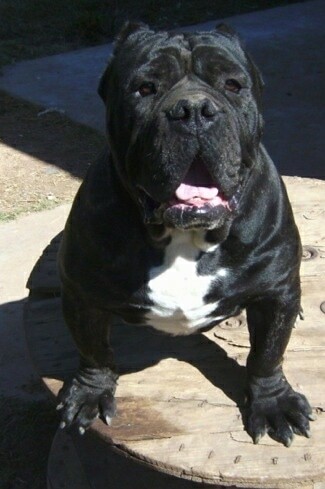 Honor the F1 Italian Bulldogge at 2 years old—"His dad is an Olde English Bulldogge and his mother is a Neo Mastiff. We refer to him as H. on the Internet. He is a foundation Italian Bulldogge. He weighs in at 115 lbs. and is 18 inches short. He is a very laid-back dog, but loves to play with towels. He does well in hot weather as we are in AZ. He loves chicken. He is a great dog and is well balanced. He is moderately active and is not overprotective. He does regular patrols of the yard and is still calm enough to walk around the house. He will even go in his cage on command." The Italian Bulldogge is not a purebred dog. It is a cross between the Neapolitan Mastiff and the Olde English Bulldogge. The best way to determine the temperament of a mixed breed is to look up all breeds in the cross and know you can get any combination of any of the characteristics found in either breed. Not all of these designer hybrid dogs being bred are 50% purebred to 50% purebred. It is very common for breeders to breed multi-generation crosses. 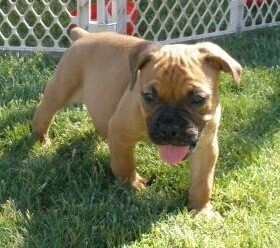 Male tan and black Italian Bulldogge puppy—Honor, shown above, is the father. 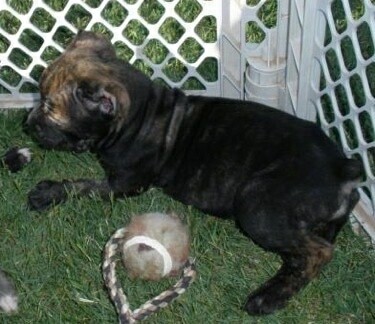 Female brindle Italian Bulldogge puppy—Honor, shown above, is the father.